CLICK HERE TO LEAVE US A REVIEW ON GOOGLE OR FACEBOOK FOR 10% OFF YOUR NEXT PURCHASE! 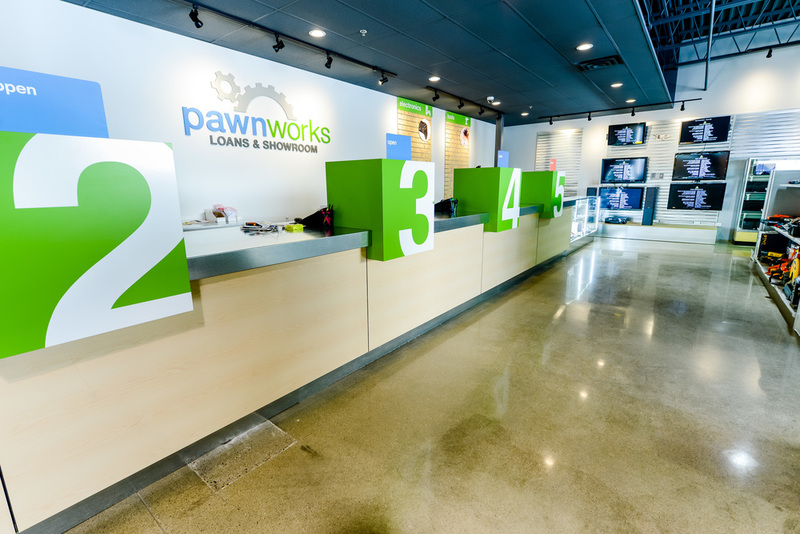 Pawnworks is the newest pawn store concept in the Twin Cities. We currently have a location in Burnsville, Minnesota. Our store is designed to have a fast, fair, friendly approach with every guest. The aesthetics, design and the way we set up the store is a fresh take on what you would find in a typical pawn shop. Our focus is assisting the people in the communities we serve when traditional banking and lending options are not available. We are here to assist anyone in need of a fast short term collateral loan. Pawnworks also provides value shopping for the advantageous consumer who understands slightly used is better than paying brand new prices. We guarantee our merchandise with a free return/exchange policy. A pawn loan is another name for a collateral loan. This is when money is lent in exchange for items of value with the loan amount based on the item’s value. The item is returned when the loan is paid off, or can be surrendered as payment in full. Additional time may be created to redeem the loan by making payments. See associates for details. When you bring an item to PawnWorks for a pawn loan, we’ll first evaluate the item to determine its value. Loan amounts vary according to the item’s value. Your loan amount will be determined based on factors such as product demand, condition of the item and accessories accompanied with the item. Should you choose to accept the pawn loan, you’ll receive cash on the spot and will have a set period of time in which to repay your loan. When you return to pay back the loan, we’ll promptly return your item. While your item is in pawn, you still own it. It is our duty to keep it safe and in good condition while it’s in our care. When you give us an item for pawn, we keep all accessories (remote controls, cables, etc.) with your item and place it in a secure area. Your item is safely stored until you return to pay your pawn loan in full and reclaim it. PawnWorks is insured for the loan value of the collateral we keep. Thank you! You'll receive a response shortly. E-mails will be answered in the order received. Loan or purchase amount must exceed $1,000 to qualify for reservation. First time loan customers will receive their first month interest free for 30 days. Prices so low, we can't advertise! Stop in for extreme savings! For a limited time only, see associate for details. Soonest ending K-bid Auction. Click here! We announce our sales and promotions on Facebook and Instagram first! LEAVE US A REVIEW ON GOOGLE OR FACEBOOK FOR 10% OFF YOUR NEXT PURCHASE! CLICK HERE! We are looking for high energy, dedicated, reliable applicants. Working for Pawnworks offers tremendous growth opportunities if you possess the right attitude and skills. We are a unique retailer that understands the value of teamwork. Applicants must provide resume upon request. Great store management is essential to any successful retail organization. An exceptional manager achieves a productive and effective workforce that achieves financial goals, reduces costs, and elevates customer relations. This position is accountable for the day-to-day operations of the store. You will need to demonstrate an ability to lead, coach, and develop store employees. Previous pawn management experience is required, and applicants must provide a resume upon request. An E-Commerce associate performs listing, pricing, and selling through multiple online platforms. Strong photography, customer service, and sales skills are a must. Applicants must have resume available upon request. Pawnworks is a Federally Licenced Firearms dealer. We buy, sell, and loan on pistols, revolvers and long guns. We offer competitive pricing and reduced interest rates for firearm loans. Additionally, if you possess an unwanted firearm you'd like to dispose of safely, ethically and legally we are here to help! Layaway is available for all new firearms!